The winners of the Swiss Poster Award 2016 have been chosen. They were presented at the APG|SGA Poster Night in Zurich on 9 March 2017. From over 340 creations entered, 14 walked away with one of the gold, silver or bronze trophies. The title of “Poster of the Year” was awarded to Stiftung für das Tier im Recht with its outstanding campaign “Animals as rubbish”. This year’s “Poster of the Year” award goes to an emotional poster campaign from the Ruf Lanz advertising agency. Animals are often thrown away like rubbish by their owners. 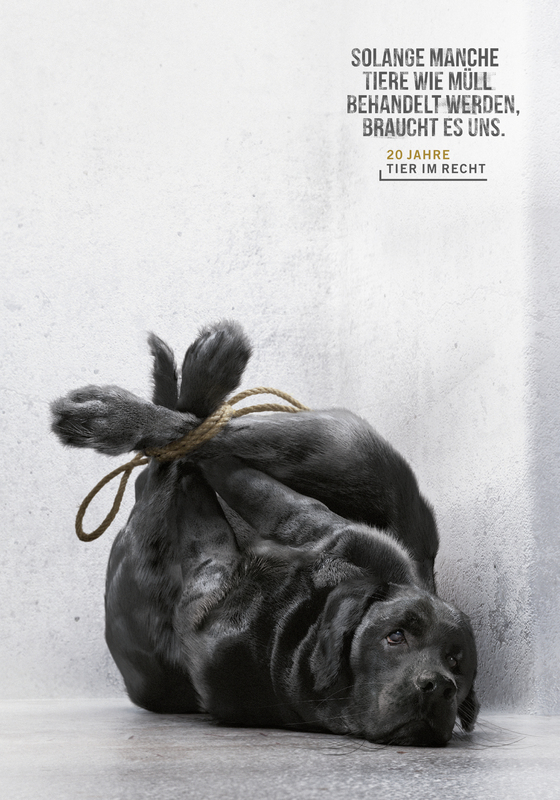 This tragic reality in many households is depicted on the outstandingly designed posters by Stiftung Tier im Recht to raise awareness of cruelty to animals. “The “Animals as rubbish” series makes injustice visible, triggers emotions, appeals to our conscience, and spurs us to take action,” said jury president Christian Brändle. That’s why the jury chose the campaign as this year’s winner. 9 March 2017 in the newly opened Samsung Hall. And it wasn’t only the competition entries that provided some surprises on the night, but also the new stage design. Marcel Weiss, Nicole Mettier and Georg Vogel presented the nominated posters in hand-crafted paper and cardboard scenarios. A technique known as stop-motion brought the world of out-of-home advertising to life, transporting the audience to a new dimension. The show was presented by Röbi Koller, who accompanied the guests throughout the evening with the slogan “Experience Out of Home”. For the show act, tango couple Annatina Luck and Daniel Aranda and musician Christine Schmid slipped into the role of street entertainers. The winners of the biggest poster competition were then celebrated in an informal atmosphere at the dinner party. The buffet was modelled on a street food festival, with various “market stalls” offering culinary treats to discover and enjoy. The winners, jury and over 350 guests – among whom were some well-known figures from the advertising industry – celebrated Poster Night until the early hours.